The scientific knowledge of below ground root-bacteria-metal system is still significantly limited. A unique study based on the use of synchrotron X-ray absorption spectroscopy (S-XAS) to determine the accumulation and speciation of zinc (Zn) in roots of Brassica juncea exposed to Zn contamination following inoculation with Pseudomonas brassicacearum and Rhizobium leguminosarum provides robust evidence that bacteria ameliorate Zn toxicity by sequestering Zn in compounds that reduce its bio-toxicity and at sites devoid of Zn sensitive organelles. The inoculation of metal-remediating plants with plant growth promoting bacteria (PGB) has been observed to promote growth while increasing metal accumulation in plants under metal contamination; a process that could be further explored in developing ‘green’ remediation technology for metal contaminated environments [1,2]. However, the mechanisms behind enhanced plant growth in the face of high toxic metal bioaccumulation remain poorly-known. While research to identify the role(s) that PGB perform in plant-microbe symbiotic relationships in contaminated environments is ongoing worldwide, symbiotic nitrogen fixation, essential plant macro and micro nutrient release, protection of plants against pests and diseases, microbial metal sorption and maintenance of optimum level of phytohormones secretion has been suggested has possible means through which PGB promotes growth and metal accumulation in plant under metal toxicity [3,4]. However, studies conducted in metal contaminated media where the essential plant nutrients and growth hormones are provided and under experimental conditions free of plant pests and diseases have reported reductions in metal toxicity in plants inoculated with PGB. These observations have been linked to possible changes in metal speciation induced by bacteria and this is being regarded as a major plant growth promoting mechanism [5-7]. Although these studies provided valuable insights towards the understanding of the roles of PGB in metal sequestration, they mostly utilized destructive analytical techniques (like chemical extraction of hormones, enzymes and nutrients from bacteria and plants) to study bacteria, metal, and plant as three different units and the likelihood of metal speciation changing during these destructive sample preparation method are very high [3,6,8-11]. The bacteria-metal-plant system is however a dynamic system that needs to be studied as a unit under minimal disturbance in order to properly identifies the roles of PGB in metal translocation, sequestration and possible changes in speciation in plants. To investigate possible changes in metal speciation/coordination within the plant-microbe-metal system, a factorial, fully replicated plant growth experiment was conducted in a glasshouse at the University of Edinburgh UK by planting Brassica juncea (a well-known metal accumulating plant) inoculated with Pseudomonas brassicacearum (an endophyte isolated from a Brassica plant) and Rhizobium leguminosarum (a rhizophyte isolated from a clover plant), on soil contaminated with 400 mg kg-1 Zn (the most widely studied metal contaminant) added as Zn sulphate . To ensure minimum disruption in bacteria-metal-plant system, live plants were transported to the Diamond Light source; UK's national synchrotron science facility, at 5 weeks after planting. Root strands were immediately subjected to combination of Synchrotron based micro-X-ray Fluorescent Imaging (μ-XRF) to study nature of Zn accumulation and micro-X-ray absorption near edge structure (μ-XANES) spectroscopy to probe Zn speciation in the plant roots . 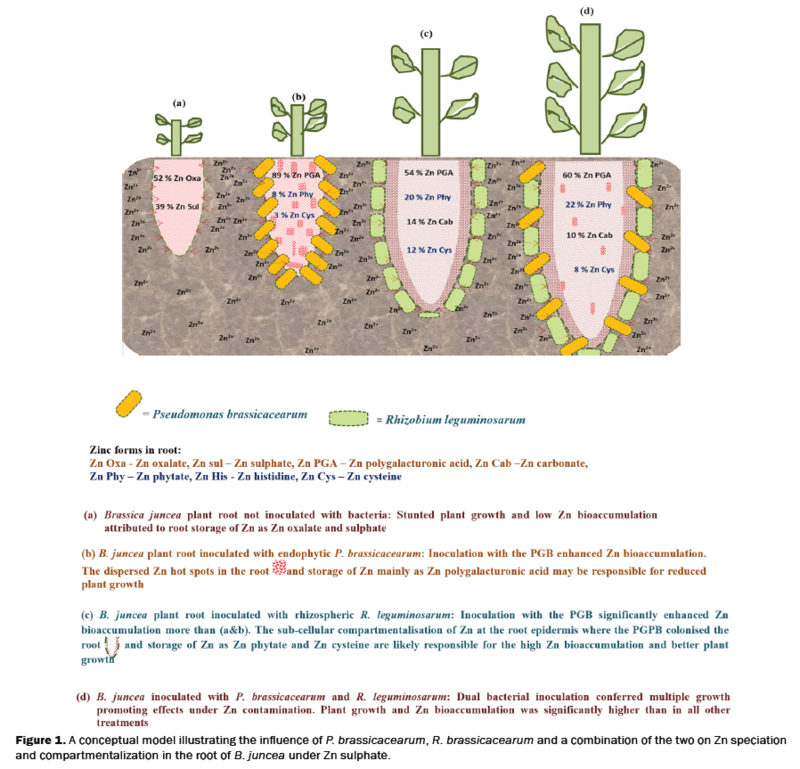 Although bacteria inoculations significantly enhanced Zn accumulation, P. brassicacearum exhibited the poorest plant growth promoting ability, while R. leguminosarum alone and in combination with P. brassicacearum significantly enhanced B. juncea growth and Zn bioaccumulation . A subcellular analysis of plant root by μ-XRF imaging showed that the PGB enhanced tolerance to Zn contamination by enhancing epidermal Zn compartmentalization depending on the nature of root colonization [1,12]. In plants without root nodules (like B. juncea), R. leguminosarum mainly resides at the rhizosphere of the plant roots [12,13]. P. brassicacearum on the other hand, was isolated from the root of a Brassica plant and has been shown to be capable of colonizing interior root areas [12,14]. R. leguminosarum therefore appear to mediate contact of Zn with Zn sensitive organelles in the plant roots by ensuring only enhanced accumulation of Zn at the rhizosphere of B. juncea root [1,12]. Furthermore, μ-XANES analysis showed that reduced plant growth in un-inoculated plants and plant inoculated with P. brassicacearum was due to root accumulation of Zn as Zn sulphate, Zn oxalate and Zn polygalacturonic acids; forms that has been reported to be toxic to plant growth. Whereas, the better growth and increased metal accumulation observed in plants inoculated with R. leguminosarum and its combination with P. brassicacearum was attributed to root storage of Zn in the chelated and less toxic forms of Zn phytate and Zn cysteine [1,12]. A conceptual model illustrating this newly observed phenomenon is presented in Figure 1. Figure 1:A conceptual model illustrating the influence of P. brassicacearum, R. brassicacearum and a combination of the two on Zn speciation and compartmentalization in the root of B. juncea under Zn sulphate. Inoculation of metal accumulating plants with bacteria that are genetically modified to improve their ability to secrete phytochelatins, and the use of transgenic plants are active areas of phytoremediation research [15,16]. Apart from providing new insights to the mechanisms of enhanced growth under metal toxicity, a microbial-phytoremediation system that combines the use of two or more bacteria on a metal remediating plant, is being suggested as a more affordable and sustainable alternative for remediation of soils contaminated with toxic metals. Nevertheless more studies are required with different bacteria combinations and other metal contaminants to confirm this assertion. Adediran GA, et al. Mechanismsbehind bacteria inducedplantgrowthpromotion and Zn accumulation in Brassicajuncea. Journal of Hazardous Materials.2015;283:490-499. Ma Y,et al. Improvement of plantgrowth and nickeluptakebynickelresistant-plant-growthpromoting bacteria. J Hazard Mater. 2009;166:1154-1161. Rajkumar M and Freitas H. Influence of metal resistant-plantgrowth-promoting bacteria on thegrowth of Ricinuscommunis in soilcontaminated with heavy metals. Chemosphere. 2008;71:834-842. Ma Y, et al. Plantgrowthpromoting rhizobacteria and endophytesacceleratephytoremediation of metalliferoussoils. BiotechnologyAdvances. 2011;29:248-258. Burd GI, et al.Plantgrowth-promoting bacteria thatdecrease heavy metal toxicity in plants. Can J Microbiol. 2000;46:237-245. Wu SC, et al.Effects of inoculation of plantgrowth-promoting rhizobacteria on metal uptakebyBrassicajuncea. EnvironPollut. 2006;140:124-135. Madhaiyan M, et al. Metal toleratingmethylotrophic bacteria reduces nickel and cadmiumtoxicity and promotesplantgrowth of tomatoLycopersiconesculentum L. Chemosphere. 2007;69:220-228. Khan M, et al. Role of plantgrowthpromoting rhizobacteria in theremediation of metal contaminatedsoils. EnvironmentalChemistryLetters. 2009;7:1-19. Feldmann J, et al. Samplepreparation and storage can changearsenicspeciation in human urine. Clin Chem. 1999;45:1988-1997. Hammer D and Keller C. Changes in the rhizosphere of metal-accumulatingplantsevidencedbychemicalextractants. J EnvironQual. 31: 1561-1569. Amaral CD, et al. Samplepreparationforarsenicspeciation in terrestrialplants: a review. Talanta. 2013;115: 291-299. Schloter M, et al. Rootcolonization of differentplantsbyplant-growth-promotingRhizobiumleguminosarumbv. trifolii R39 studied with monospecificpolyclonalantisera. AppliedEnvironmentalMicrobiology. 1997;63:2038-2046. Long HH, et al. Nativebacterialendophytespromote host growth in a species-specific manner; phytohormone manipulations do notresult in commongrowth responses. PLoSOne. 2008;3: e2702. Bañuelos G, et al. Transgenicin dianmustardoverexpressingSelenocysteineLyaseorSelenocysteine Methyltransferase exhibitenhancedpotentialforseleniumphytoremediationunderfieldconditions. EnvironmentalScience&Technology. 2006;41:599-605. Zhang Y,et al. Enhancedphytoremediation of mixed heavy metal (mercury)–organicpollutants (trichloroethylene) with transgenic alfalfa co-expressingglutathione S-transferase and human P450 2E1. J Hazard Mater. 2013;260:1100-1107.